My first real heartbreak was the loss of our beloved family dog, Sugar. She had been my constant companion for as long as I could remember, and then one day she wasn’t there anymore. It was a hard thing for me to understand. The loss of a pet is a sad time for the whole family, but it can be especially hard for young children who might be experiencing death for the first time. 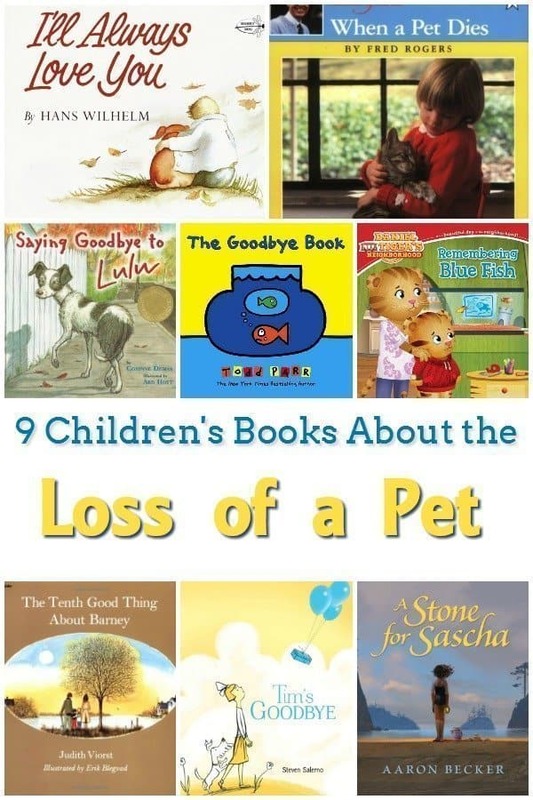 Luckily, there are some really excellent books about pets dying that can help kids learn how to cope with loss and grief. They give kids space to feel their emotions while letting them know that the deep sadness they feel won’t last forever. I hope these books can help your family get through a difficult time together. When A Pet Dies by Fred Rogers — The pictures in this book are dated, but the content is exactly what you’d expect from Mr. Rogers. This excellent book teaches kids that sadness and grief are normal reactions to loss, and that recognizing those emotions can help them heal. I’ll Always Love You by Hans Wilhelm — Elfie was “the best dog in the whole world,” especially to her favorite little boy. One day, Effie does not wake up, and her friend and his family remember her and grieve together. Told in the first person, young readers will be able to relate to the narrator and the love he has for his dog. Remembering Blue Fish by Becky Friedman — Daniel Tiger is very sad when he finds his favorite fish, Blue Fish, has died. He has lots of questions about what death means and how to manage the sad feelings in his heart. The grown-ups in his life answer his questions in a way that will help your children process loss and grief. Saying Goodbye to Lulu by Corinne Demas — A little girl is dealing with the fact that her beloved dog Lulu is getting older. Lulu cannot do all the things she used to do, and her young owner must face the fact that her friend will not live much longer. When Lulu passes, her friend is sad, but she also realizes that her memories of Lulu will last forever. The Tenth Good Thing About Barney by Judith Viorst — A young boy has lost his pet cat, Barney, and his family is having a funeral for their pet. The boy’s mother tells him to think of ten good things to say about Barney at the funeral, but the boy can only think of nine. It’s not until later that the boy discovers the tenth thing, and it helps him understand more about grief and loss. This is one of the best books about pets dying that I’ve come across. The Goodbye Book by Todd Parr — I absolutely love Todd Parr’s books because they speak directly to kids in a way that is easy for them to understand. This book is no exception. It talks to kids about how they might be feeling after losing someone special, and let’s them know that how they feel is normal and ok. This book would be appropriate for any type of loss a child might be facing. Tim’s Goodbye by Steven Salerno — Margot is sad that her pet Tim has died, so she brings her friends together to honor his life and say goodbye. Their simple recognition of Tim helps Margot make peace with the loss. This sweet story is accompanied by gorgeous illustrations that have a classic feel. A Stone for Sascha by Aaron Becker — This beautiful wordless picture book tells the story of a family going on their first vacation without their beloved dog, Sascha. The young girl in the story is sad, but a special walk on the beach helps her cope with her feelings of grief and loss. This story would be best understood by school-aged children. Scout’s Heaven by Bibi Dumon Tak — I know the word “heaven” doesn’t work with every family’s worldview, but this sweet story paints a picture of a non-religious heaven where dogs can run and play. A little boy is sad when the family dog, Scout, dies, and thinking about what Scout might be doing in her own personal heaven helps him feel better. If you’re comfortable with that viewpoint, you’ll love this book.